FIRST IN A SERIES OF MID-ATLANTIC GATEWAY TIMELINE REFERENCE BOOKS! The Andersons are one of pro-wrestling's greatest families, known worldwide as the infamous Minnesota Wrecking Crew. Their history is explored here in a timeline that stretches across five decades. Month by month, year by year, the story unfolds with all the angles, feuds, territories, and traditions. It is all here in one concise reference book sure to bring back great memories of a time long ago when men were men - and the toughest of them were named Anderson. Gene Anderson was the first, the original, and the foundation. In Anderson lore, he is joined by his brothers Lars and Ole, and later by cousin Arn, son Brad, and nephew Bryant. Another cousin winds his way through this tale as well - the "Nature Boy" Ric Flair! Over 40 vintage photographs from throughout their amazing careers! 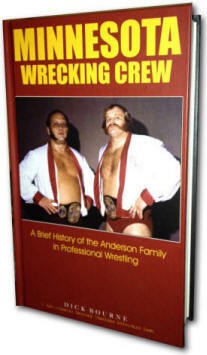 With research drawn from thousands of match listings and newspaper results, as well as hundreds of hours of audio and video tape, Minnesota Wrecking Crew is a complete look at the Anderson dynasty in professional wrestling. Blurb ships worldwide and accepts all different sorts of payment options. The Hard Back edition of Minnesota Wrecking Crew is available exclusively through Blurb.com. Softcover Also available at the world's largest Pro-Wrestling Superstore - - Highspots.com!